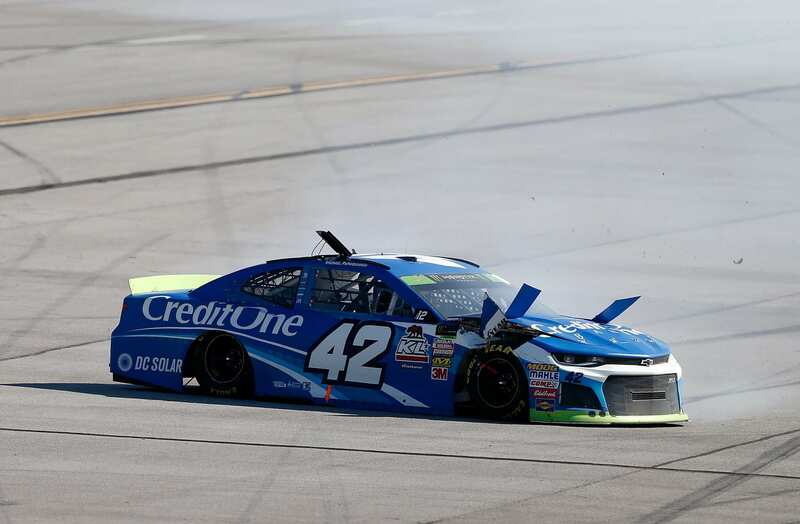 Following a spin at Talladega, Kyle Larson blew a front tire. That tire then caused damage to the right front fender. The team went under the crash clock with 6 minutes allowed for repairs. In the course of repairs, teams are only allowed to use the original panels and fasteners in addition to the use of duct tape. The team had custom fasteners created for quick repairs. Those were not the original fasteners used to install the body. Per the NASCAR rules, Kyle Larson was issued an L1 penalty following Talladega Superspeedway. He now heads into Kansas Speedway, a cutoff event in the NASCAR playoffs. 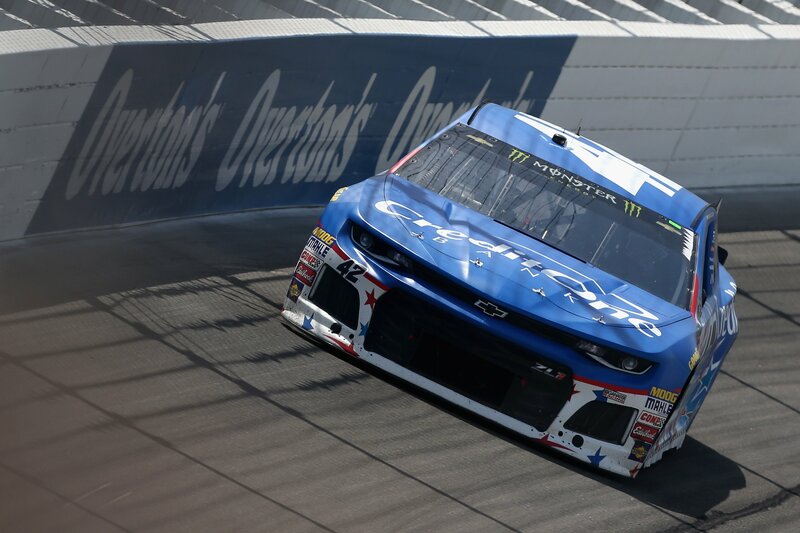 With the 10 point penalty installed, Larson now sits 36 points below the cut off line. “Obviously, a 10-point penalty doesn’t help, but I felt like with even being 26 points back, we were going to probably have to go into this week and get a win to make it to the next round,” Larson said ahead of opening practice at Kansas Speedway. “It doesn’t really mean much to me, the 10 points, like I said just because I view this weekend or viewed it before that we had to come in here and win,” Larson concluded. He also said that he didn’t know whether or not his team would appeal the penalty or not. Chip Ganassi did elect to appeal the penalty. NASCAR rushed the appeal to be heard this morning at Kansas Speedway. The results are in. The three person panel has elected to keep the penalty it was original issued. The team has the option to send the case to the final appeals officer. He would have the options of decreasing, increasing or to keep the penalty as is. The team has until noon local time to make a decision. The National Motorsports Appeals Panel today heard and considered an appeal of an L1 penalty issues on October 17th to Chad Johnson (crew chief), David Bryant (car chief), Kyle Larson (driver) and Chip Ganassi Racing (owner), relative to the No. 42 Monster Energy NASCAR Cup Series team at Tallaega Superspeedway. The penalty concerns the following section in the 2018 NASCAR Rule Book: Section 10.9.9.d Damage Vehicle Policy/Mechanical Repair. The original penalty assessed: Johnson was fined $25,000; Byrant was suspended from the next Monster Energy NASCAR Cup Series Championship Points Event; Chip Ganassi Racing was assessed with the loss of 10 Monster Energy NASCAR Cup Series owner points. Larson was assessed with the loss of 10 Monster Energy NASCAR Cup Series driver points. 1.) The the appellants violated the rules set forth in the penalty notice. 2.) That the panel affirms and upholds the original penalty assessed by NASCAR. The appellants have the right to appeal the decision of the National Motorsports Appeals Panel to the National Motorsports Final Appeals Officer, and the request must be made by noon CT on October 19, 2018. Chip Ganassi Racing has election to take the case to the final appeals officer. Today, The Monster Energy NASCAR Cup Series field will be on track twice. The opening round of practice is set to begin shortly. Later tonight, they will return to the surface for qualifying. The CGR #42 will get their car chief back for the day until the final appeal can be heard. Without the appeal, car chief David Bryant would be suspended for the weekend. Somewhat unofficially, the main role of the car chief is to get the car through inspection. The final appeals officer is set to hear the case tonight at 8pm. The hearing will follow qualifying from Kansas Speedway. The final hearing took place after qualifying tonight at Kansas Speedway. National Motorsports Final Appeals Officer, Bryan Moss served as the final step in the appeal process. The hearing results were released nearly three hours after the hearing began. Ruling: The penalty stands. Car chief David Bryant will have to leave the speedway for the remainder of the weekend.